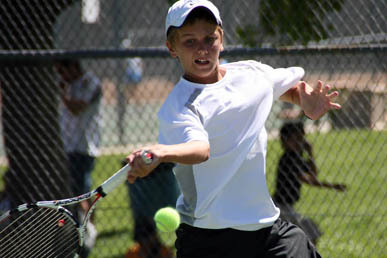 12 year old Nathan Ponwith of Scottsdale, Arizona took first place at the Nike Junior Tour USA National Masters at the Evert Tennis Academy on Sunday, September 19th in Florida for Boys 12 & under, a Level II USTA National event. To be invited to the tournament, Ponwith played in the Nike Junior Tour (NJT), a worldwide series of junior singles tournaments for Boys and Girls in the 12 and 14 age groups. Ponwith will now advance to play in the NJT International Masters, taking place this year at Club Med - Columbus Island, Bahamas, December 8-15. ABOUT THE NIKE JUNIOR TOUR (NJT): The Nike Junior Tour (NJT) is a worldwide series of junior singles tournaments for Boys and Girls in the 12 and 14 age groups. There are currently 28 countries participating in the NJT, representing over 60,000 players. Former NJT International Masters participants include Rafael Nadal, Juan Martin Del Potro and Tomas Berdych. Countries scheduled to participate in the International Masters include: - France, Italy, Spain, Holland, Belgium, Switzerland, Austria, Sweden, Germany, Poland, Slovenia, Croatia, Great Britain, Slovakia, Czech Republic, Hungary, Russia, Australia, Israel, Argentina, USA, Mexico, Chile and South Africa. The Section winner(s) are invited to compete at the NJT USA National Masters at the Evert Tennis Academy, September 17-19. The NJT USA National Masters is a Level II USTA National event. Nike provides round trip transportation, food and lodging for the Section winner(s) (B14, B12, G14, G12) plus one team coach. The NJT USA National Masters winners advance to play in the NJT International Masters taking place this year at Club Med – Columbus Island, Bahamas, December 8–15.